You can deduct cash gifts up to 50 percent of adjusted gross income. On a $10,000 cash gift in a 28 percent tax bracket, you save $2,800 in taxes. Our secure, online donation page makes giving easy. Choose the giving option that works best for you, designate the amount you′d like to give by credit card, and click to submit. The Phonathon is Geneva′s student-led fundraising team that raises support by calling you. Our student staff loves calling alumni, taking prayer requests and raising support while working for the Phonathon! Meet our faithful callers. Set up a convenient and easy way to give monthly either by credit card or by direct debit from a checking or savings account. Email the completed form to lafurtad@geneva.edu, or send via mail to Institutional Advancement. If you would like more information about monthly giving, e-mail Laura Furtado, Director of Donor Services & Research, or call her at 724.847.6525. When you provide an endowment, you give a permanent fund or source of income to the Geneva community. Your donation will keep on giving for generations to come. Cash or stock that is contributed to the endowment is invested as principal, with the annual income used for the purpose the donor has designated. A minimum gift of $25,000 is required to establish an endowed fund, although gifts of any size may be designated for a current endowed fund. For more information, please contact the office at 724.847.6514. Geneva employees are able to give back through payroll deduction. To sign up, please visit Human Resources for the appropriate form or contact the Institutional Advancement office at 724.847.6514. You can deduct cash pledged over a period of years, up to 50 percent of adjusted gross income for the portion given each year. On a $30,000 cash gift over three years ($10,000 each year) in a 28 percent tax bracket, you save $2,800 in taxes each year. Appreciated stock (held more than one year) makes an excellent gift. You will receive a tax deduction for the fair market value of the securities, and eliminate any capital gains assessments on the future sale of securities. In some cases that could be as much as 23.8% in addition to a savings on State income tax. Excess contributions may be carried forward for up to five subsequent tax years. If your portfolio includes appreciated securities, you may find it advantageous to use these assets to make a gift to Geneva College. If you donate to Geneva appreciated securities that you have owned for more than one year, your charitable contribution will be based on the full market value of your gift and you will completely avoid federal capital gains tax on the transfer. Before you initiate your gift, please call Laura Furtado, Director of Donor Services at 724.847.6525. Geneva requests advance notice of transfers to allow us to prepare for the transfer, and then to promptly acknowledge your gift. Notify your broker that you want to make a gift of stocks or bonds to Geneva and instruct your broker to transfer the securities, if DTC-eligible, to Geneva′s account with Schwab. Bonds and mutual funds are similar to cash in their tax treatment in most cases. State, Municipal, and U.S. Government Bonds are welcome. Bonds left in your estate to Geneva College will incur no federal estate tax. The P.O.D. stands for Payable on Death. You retain full ownership and full control during your lifetime. At your death, the account balance is paid to Geneva College immediately and without any probate costs. In exchange for a gift of cash, stock or securities, Geneva College will pay you (and your survivor, if two-life, or another person you name) a guaranteed income for life based on your age(s). You receive a substantial tax deduction in the year of the gift with a five-year carry forward for any excess, and part of the annual income is tax-free. Upon your death(s), the gift remainder supports Geneva College. Similar to a gift annuity except that payments begin at a future date determined by you – your retirement, for example. Your income tax deduction and annual rate of return increase the longer you wait to start payments. An excellent retirement planning vehicle. Donors can select the rate of return from these income arrangements and also choose a fixed or fluctuating annual payment. Capital gains taxes are completely avoided on appreciated assets and you will receive a tax deduction based on the age of the income recipient and the rate of return. In a charitable lead trust, assets (cash or securities) are transferred to a trust that makes annual payments from the trust fund to Geneva College for a predetermined number of years. At the end of the trust term, the trust terminates and the assets are transferred back to family or a dynasty trust for family. The income tax deduction you receive is for payments made annually to the organization. One of the simplest giving methods is to give from your estate. You can make a bequest gift, after others have been provided for, of a dollar amount, specific property, a percentage of the estate, or what is left (remainder) to Geneva College. Some people adopt the College as one of their children and allocate a portion of their estate to further our mission. for the value of the gift. organization with a modest annual payment. Retirement Account Funds (IRAs or company plans) beyond the comfortable support of yourself or loved ones may be donated (similar to life insurance proceeds) to Geneva College with a proper beneficiary designation. These assets could be highly taxable to your beneficiaries. Gifts of personal property are always welcome, including collections, royalty, and mineral rights. Charitable tax deductions are available in the year of the gift. These gifts are subject to approval by the Geneva College Gift Acceptance Committee of the Board. Please contact the staff at Geneva College so that we can help you determine whether a specific gift of Tangible Personal Property will likely be for related or unrelated use. For gifts of artwork in the hands of the artist who created it, deduction is for cost basis only. One of the most overlooked gift forms is real estate. We will be happy to discuss the possible gift of land, a house, or vacation home. You will receive a tax deduction for the full fair market value, as well as avoiding all capital gains taxes. These gifts are subject to approval by the Geneva College Gift Acceptance Committee of the Board. Receive a substantial income tax deduction by giving (deeding) your home or farm to Geneva College. You continue to live there, maintain the property as usual, and even receive any income it generates. At your death, the college will sell your property to support the mission. These gifts are subject to approval by the Geneva College Gift Acceptance Committee of the Board. A maintenance, insurance, and tax agreement usually accompanies a life estate gift. Gifts of goods or services are accepted by Geneva College with prior approval by the Geneva College Gift Acceptance Committee of the Board. Ordinarily these gifts will be credited toward the campaign at their full market values (determined by appraisal provided by the donor or other appropriate valuation techniques). By contributing commodities (wheat, corn, cattle, etc.) to Geneva College, you are benefiting students with the full cash value of your donation. Many employers have matching gift programs that will match any charitable contribution made by their employees and, in some cases, their retirees. 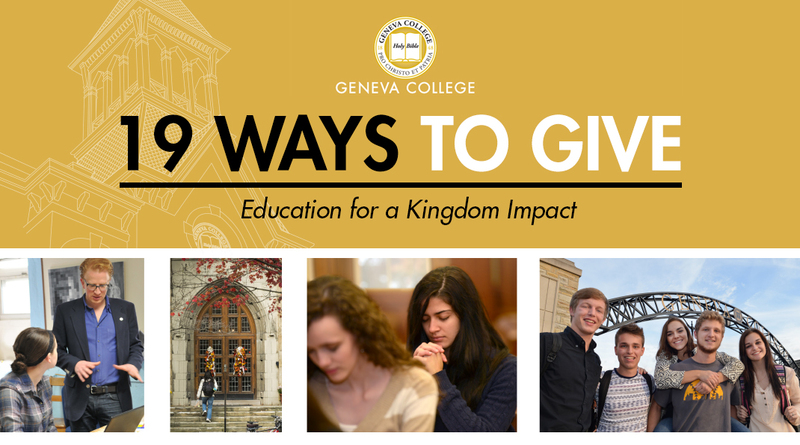 These programs can increase the size of your gift to Geneva College. Find out if your company has a matching gift policy.